Shop Appalachian Outdoors online at APPOutdoors.com where you will find a large selection of clothes for men, women and kids, camping/hiking products, skateboarding, snowboarding and skiing products and much more. AppalachianOutdoors.com carries well known brands such as the Life is Good, Patagonia, Crocs, Keen, Columbia, Clif, Teva and many more. Save on your next purchase from APPOutdoors.com with Appalachian Outdoors discounts, Appalachian Outdoors coupons and Appalachian Outdoors savings from 58coupons.com. Act now and enjoy free shipping when you spend over $50 or more on Oakley / Smith Optics from APPOutdoors.com with this coupon code. Act now and save 25% on the men's Mountain Hardware Canyon shirt at APPOutdoors.com. Click link. Act now and save big, up to 50%, on camping, hiking, and skiing gear, plus clothing and shoes at Appalachian Outdoors. Click link to start saving. 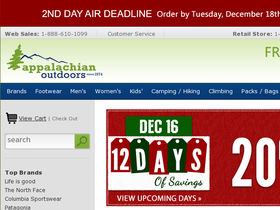 Now you can enjoy flat rate ground shipping at Appalachian Outdoors. Click link to begin.